High in the remote juniper covered valleys of Utah's Mountain Home Range a herd of Spanish horses has survived with little to no outside influence. They are believed to be one of the purest herds of Spanish horses left in America. In 1840 the most daring horse-stealing raid to ever occur took place. A Ute Indian chief and a one- legged mountain man raided the missions of southern California of their most prized horses. More than 3,000 horses were stolen and driven north into Utah. 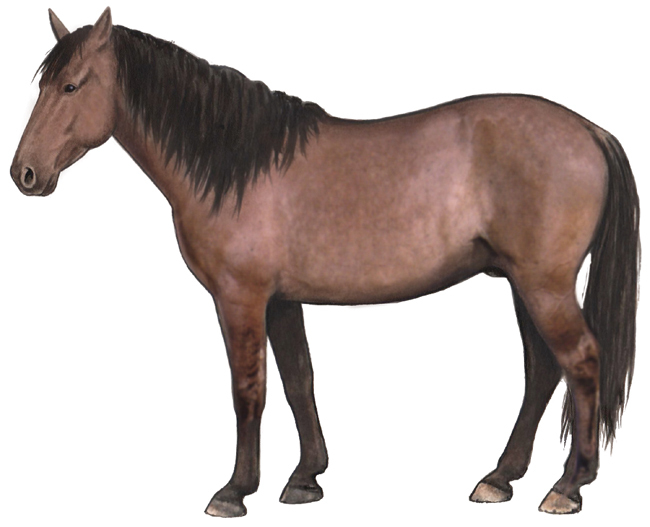 The Sulphur herd is thought to descend from these and other horses. The Sulphur horses have retained many of the characteristics of the Iberian Sorraia, the primitive ancestor of the Iberian Saddle Horse. They are strikingly beautiful horses usually of dun, grullo (mouse gray ) and red dun coloration with dorsal stripes along their backs and strong zebra stripes on their legs. These strong primitive markings have earned the herd the nickname " Utah's Zebra Horses". Compact in size, these horses are easy to maintain. They are very agile and have great endurance.